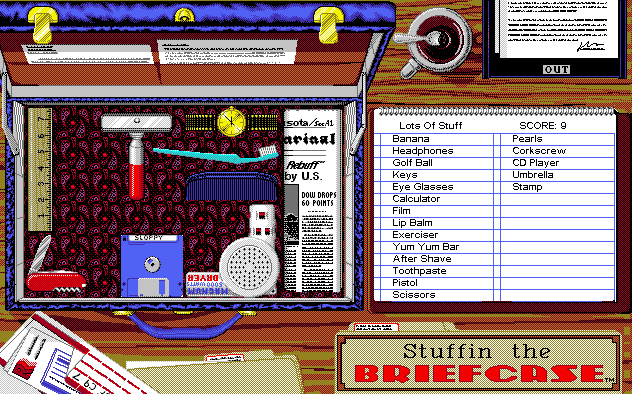 Stuffin the Briefcase makes a game out of an everyday activity – packing a bag. Epyx included this game as part of the Getaway Entertainment 6 Pack, a collection of games for laptops in the early 90s. The Getaway pack has six small, simple games, like a dominoes game and a variation of Mastermind; they’re little timewasters intended for someone to play while traveling, something they’d kill time with on a train ride, the mobile games of their time. Stuffin the Briefcase, the most creative of the pack, is the only one that sticks with the travel theme. 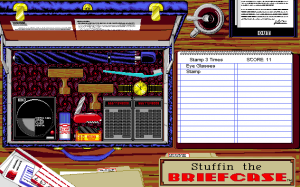 The game presents you an empty briefcase with a list of items to pack. For whatever trip you’re taking, you’re bringing newspapers, candy bars, razors, lip balm, eyeglasses, golf balls, a toothbrush, and other household objects. Each item has a different shape, some that easily fit into a briefcase and others that don’t, like a pair of headphones. You have to place everything neatly into the case without stacking objects on top of each other. Especially when you start throwing in oddly sized stuff like a rubber stamp, it turns into a real hassle. 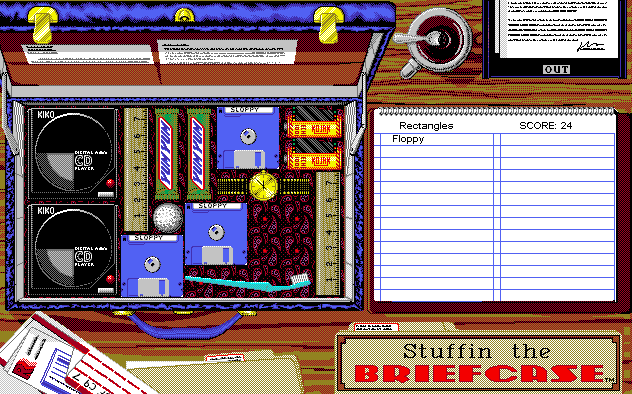 Filling up a briefcase with a variety of differently shaped objects is a good brainteaser. 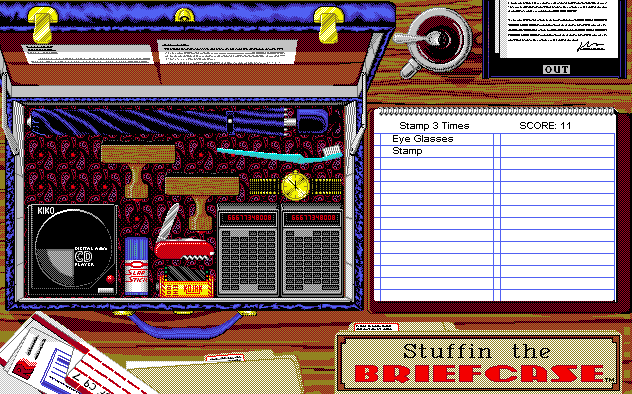 Later levels in Stuffin the Briefcase come up with new challenges, such as packing multiple cases from a single list of items or objects that stay permanently fixed in place. One level has a packing list that constantly, rapidly grows as you find more things to pack until it gets so overwhelming that you give up. That’s the most relatable one for sure. The real draw of the game, though, is its fussy detail, the tidy little objects and how they nestle into one place. All six games in the Getaway pack have terrific pixel art, and the art in Stuffin the Briefcase gives an inner life to this scene of middle-class routine. You own a briefcase with burgundy paisley lining, definitely not a neutral choice of color. There’s a half-empty coffee cup on the table with a spoon sticking out, as if you’re packing at the last minute over breakfast. It can be fun to imagine who would be packing this stuff for a business trip. Some of the levels have self-explanatory names, like “Accountant” and “Weekend.” But then you get a level like “Sharp Shooter,” where you’re packing six guns and a banana. What’s going on there? (The box for the Getaway pack actually calls attention to this, asking “Why do you need all those guns?”) No person would really toss multiple CD players and rulers into their luggage with a loose tube of toothpaste – it’s for the sake of a fun puzzle, of course – but you form an attachment to the objects. They look so cool, and I appreciated how rectangular accessories like watches and calculators line up nicely, and how an umbrella is exactly the right size to go across the top of the briefcase. It felt satisfying to work through a long, daunting packing list for the same reason it feels good to clean up. You got your things under control. Spending time with Stuffin the Briefcase lets you appreciate the outsized roles that these objects and personal effects play in our lives. We’re always taking things with us, wherever we go, and we’ve arranged it so they always just fit. The screenshots in this article are from the 1992 version of the game for Windows 3.1. The original DOS release from 1991 was in black in white, likely for less-powerful laptops with monochrome displays. According to former Epyx designer Matt Householder, quoted in David L. Craddock’s book Stay Awhile and Listen: Book 1, the Getaway pack was one of the company’s last projects before they stopped producing games. This is where Resident Evil 4 got the idea for its inventory system.